Pitting new wave/synth-pop timbres against 70’s r’n’b and disco-style rhythms, Foals are certainly giving postmodernism a good name. Formed in 2005, but not entering my consciousness until the last few years, British indie group Foals have always felt slightly out of reach – for one reason or another, I’ve always written the band off as being a Boardmasters Festival B-List booking at best. The audiences that surround the band, and their casual flippancy for music in general, are a huge turn-off. Occasionally caught off guard, finding myself asking ‘Who’s this playing? This is great!‘ and being disheartened almost upon discovering that the Oxford based indie rockers were the answer to my question, it began to dawn on me that either my musical tastes were changing, or Foals were breaking away from the pack of affiliated acts so often mentioned in the same breath. The group’s latest offering Everything Not Saved Will Be Lost – Part 1 lulls us in with airy ambience, courtesy of the track “Moonlight”. Though inconsequential, the song does put you in the same frame of mind as Burial’s Untrue, if only for a moment. Vocalist Yannis Philippakis conjures imagery of aridity, draught, and two suns. This colour palette the band are painting with is compelling for a multitude of reasons, namely some of the more Greenwood-fashioned synthesis, and a sound design that’s taking place in the stereo field. Whirring, waning saws and subs dart and dip from right headphone to left, erratically. We’re a mere two tracks in, and the band’s influences are already on full display: “Exits” acts as the record’s bellwether, and for good reason! The track captures a myriad of different musical eras within its opening minutes, and wouldn’t feel out of place on a Gorillaz record. As we depart from “Exits” and enter into the pale, layered “White Onions”, we are stuck like a needle in a locked groove. Dropped into ostinato for one hundred and eighty seconds, more or less. Reversed, Frusciante-style guitars are juxtaposed by a looping bass riff, which takes the foreground as Philippakis boldly reminisces on a youth long gone. Featuring arguably the best riff on the record, “White Onions” breaches, clears, and leaves as it came. I can’t tell if Boston Manor are ripping these guys of for vice versa, but either way I’m fine with it. Afflicted with the malady of repetition, droning the least compelling lyrics on the record, this song works as a set-opening banger, no doubt; it probably won’t be anyone’s song of the year, though. “In Degrees” suffers the fate of its predecessor in that it poses no new, challenging questions to the listener. Whilst it may boast a catchy hook, this track is not saved from the throes of mediocrity, although, the sound design, rhythms, and harmony being heard throughout do set you up for the remainder of the record nicely. Even if this track isn’t the strongest example of the fusion the band seem to be experimenting with on this record, it does set it in motion. 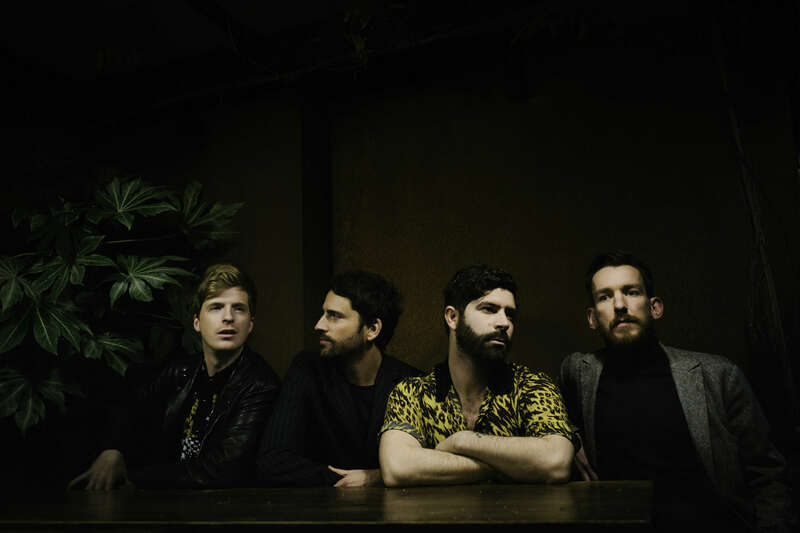 Pitting new wave/synth-pop timbres against 70’s r’n’b and disco-style rhythms, Foals are certainly giving postmodernism a good name. “On The Luna” and “Cafe D’Athens” feel like the conclusions to the dilemmas posed in the record’s opening track. While not directly correlated, the synergy between these three songs feels significant to me. The aptly titled “Sunday” swings and shuffles, as lyrically we’re faced with hard-to-swallow quips pertaining to burning cities, our general ignorance as a people, and the realities of living in a world that’s been destroyed by our fathers and left in our hands. This song overflows with tangible irony, feeling like an even more cynical, adjusted-for-blu-ray “Bittersweet Symphony” perhaps. The track then takes an unexpected twist, like a cheap garden hose (thanks, Ray…), as we’re plunged into what can only be described as Foals‘ best Underworld impression, poignantly reminiscent of 90’s rave culture, Ministry of Sound Best Of collections, and Shaun Ryder. The Ipswitch Trifecta. Closing the album while presumably tying us into its highly anticipated second instalment, closing track “I’m Done With the World (& It’s Done With Me)” doesn’t shy away from the cliché practice of ending your band’s album with a piano ballad. Of course, in what by this point we’re starting to understand as typical Foals fashion, cacophonous, burning synths still permeate the track, culminating in an intentional anti-climax. As far as idiosyncratic song structures underpinned by ear-worm choruses go, these ten songs are very stacked. I’m a sucker for songs with lots of layers, designed to be explored and uncovered with each listen, and this album is certainly not suffering from a lack of replay value. Lyrically speaking, themes of dystopia, future nostalgia, and hauntology are all covered. The album’s cover alone forces its beholder to consider a world consumed by a H.G. Wells-inspired red weed. I would feel remiss if I didn’t emphasise just how impressed I am by this album. There’s certainly the odd filler track, and the lyrics do lean on the side of repetitiveness perhaps once too often, but ultimately I’m compelled to return and keep listening until all of the easter eggs have been found. Fans of James Blake, synth pop, and perhaps even more hard rock-centric bands like Rival Sons will find themselves well represented here. I eagerly anticipate the second part of this record. Until that time, I feel like a full conclusion cannot be drawn. Previous PostMagic Circle - "Departed Souls"
Next PostCodeia Unleash Brilliance in Their New Song "emerald deception"